Every year the Super Bowl becomes one of the most watched events in the United States. If you think it has no impact on the stock market think again. With each new Super Bowl, major players will be jumping at the chance to get in on the Super Bowl advertising action. The question is, is the advertising worth it and how does it impact share prices? During the first few Super Bowls, the cost for an ad ran around $40,000. Today, it hovers around 5 million dollars! One can only assume that with the cost of advertising going up each year it must be worth it or else the demand would fall and the commercial prices would stagnate or even drop. Let’s take a look at how the Super Bowl ads have impacted some of the largest players on Wall Street. I want to start out with COKE. Coke spent 8 million dollars on a one minute ad on February 2nd 2014. Let’s see how their stock chart looks immediately following the ad. As you can see in the chart. The share price was around $68 a share and shot all the up to $88 a share after the ad. You tell me, was it worth it? Do you wish you had bought shares immediately after the ad? Let’s take a look at YUM in 2013 after spending $7.6 million during the Super Bowl. Here is the chart. Immediately after the ad the price dropped! It went from around $65 a share on February 4th all the way down to $64 a share on February 11th. However, it shot straight back up immediately following. 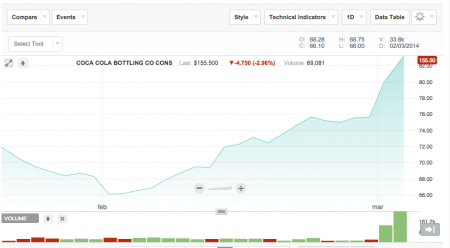 It nearly hit $72 a share by March 25th, 2013! 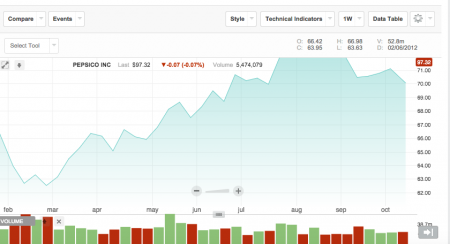 Does the initial drop in share price shake your confidence on the impact of Super Bowl ads on share prices? How about the spike that followed? Let’s take a look at another one. BUD spent big money and won over the hearts of many viewers for its “Lost Dog” ad on February 1st 2015. Let’s see how it pulled on the heartstrings of investors. The price started around around $121/share and shot immediately up to around $125/share. Then it dropped to the $118 range then shot back up to the $126 range and eventually climbed into the $127 range. There was a lot of movement in both directions. However, a swing trader could have made some profits if they timed it right. Of course, they could have lost if they had timed it wrong. Let’s try one last one. Doritos unleashed one of the top ads of 2012. They are owned by Pepsico. Let’s look at the 2012 chart for PEP. The Super bowl was on February 5th of that year. The price immediately dropped from the $66 range to the lower $63 range. It had a rough February but March through August was amazing. It steadily climbed to the $73 range. So what do you think? Did Doritos make an amazing play on this one? It seems that all of the companies that ran Super Bowl ads saw an increase in share prices in the months that followed the Super Bowl. Of course a few dropped immediately after the game so what does this mean? The real question is…did the price per share of each of the examples above have anything to do the the commercials? Some would say they did. Others could argue that the commercials had nothing to do with the share prices and that outside forces had more of an impact. Even more could argue that big companies that can afford a Super Bowl ad tend to do well anyway. In the end, it is up to you to decide. 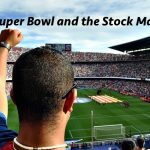 Is the Super Bowl a super booster on the share prices of those that advertise? Rather than betting on the games perhaps you could try your hand at betting on share prices instead. Of course remember to be careful when investing because you could always get sacked and lose it all! 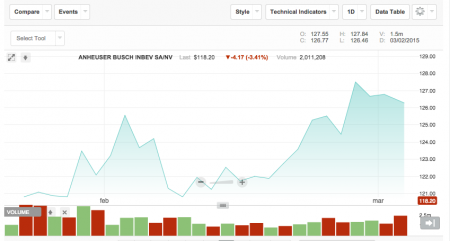 What are your thoughts on the impact of Super Bowl ads and share prices? Please let us know in the comments section below. Also, please don’t forget to check out our new stock message boards because we need your comments in order to make the boards a success. 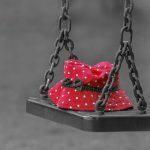 Please don’t be afraid to be the first to post! Think of it as a Junior High dance. After the first couple goes onto the dance floor everybody joins in right? The Trade Locker has a stock message board for every stock ticker on Nasdaq. The Trade Locker is also a great place for stock traders to network with each other. A Trade Locker membership is and will always be 100% free to join. If you have not done so you can get a lifetime free membership here. Are you investing in mutual funds? 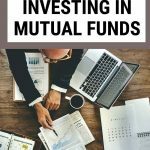 Here’s how mutual funds work, why you might want to invest in one, and how to get started making money with mutual funds. In this article, we have come up with a list of 10 simple things you can do to learn the swing trading basics. 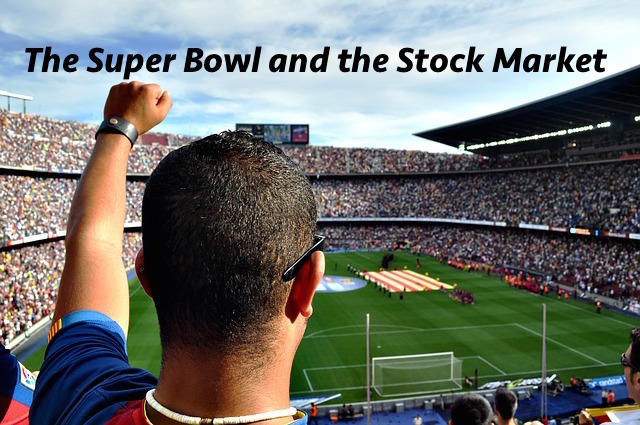 Does the Super Bowl have any impact on the stock market and stock prices? Find out here. Important: The information contained on TheTradeLocker.com is for informational and entertainment purposes only. The articles and information contained on this website are not to be substituted for professional financial advice or services. You assume all risk in any financial decisions you make. Financial decisions should not be made based on messages or content posted on this website. We created this website to share tips and resources for new traders who want to learn how to invest in the stock market. Whether you’re interested in penny stocks or swing trading strategies, we have a number of resources to help you get started trading confidently!